Going in to last week’s NA Crush Tourney, Tristan of my Soul Savers Series was the last supernatural hero remaining in the tournament. As someone who loves the New Adult age category for books, I found this disheartening. There is so much potential for the category to expand into all of the genres, not just contemporary romance and erotica. That’s for another post, though. Have you always wanted to tell a story that takes place in the Soul Savers World? Are you an artist and would like to share how you see the Soul Savers World and/or the characters in it? Do you have special talents in photography or creating awesome videos? 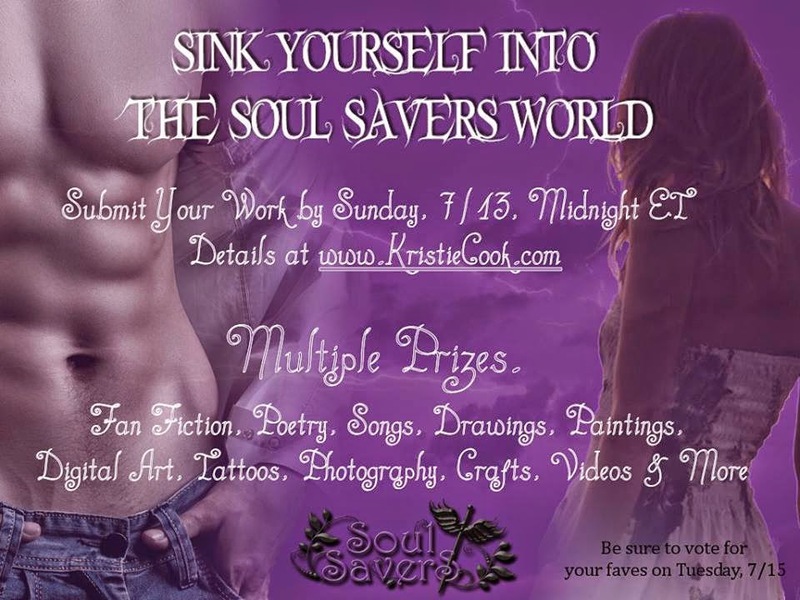 Are you a songwriter, poet, crafter, etc., who’s been inspired by Tristan, Alexis, or any part of the Soul Savers World? Submit your work and win! Share your love for NA paranormal and the Soul Savers World and showcase your talents, too! We will have a special Facebook event to share the submissions so people can vote on their favorites. There will be multiple prizes awarded, including a Kristie’s Choice Award picked by me (in case that wasn’t clear) and an Authors’ Choice Award selected by the authors who will be participating and offering up prizes at the event. MIDNIGHT ET, SUNDAY, JULY 13TH!!!! All entries must take place in, tie into, or be inspired by the Soul Savers World. Can be characters (current ones or ones you make up as long as they’re in the world), settings, objects (i.e., Alexis’s pendant, Vanessa’s trunks), symbols and logos (i.e., Amadis mark, Daemoni symbol/logo) or anything else you come up with that’s relevant to the world. All entries must somehow tie into the New Adult age category (defined here: http://naalley.blogspot.com/p/about.html). If there are people/characters, they need to be appropriately aged. If you’re submitting a visual art piece, music, or a video, make it so that it would appeal to this age group. All entries must be submitted to inga.kupp@gmail.com no later than Midnight Eastern Time, Sunday, July 13, 2014. Written word entries (fan fic stories, poetry, songs, etc.) cannot exceed 5,000 words. All entries become the property of Kristie Cook, and she may share it publicly with credit given. All entries will be posted anonymously for fair voting. Entrants’ names will be announced at the end of the event. Entry categories, prizes, and prize categories are subject to change prior to the event starting on Tuesday, July 15, 2014, depending on submissions received. Entrants will be notified by email if there are any significant changes to the event. I can’t wait to see what everyone did..
Hi! I can’t wait to see what everyone has done! This is awesome.